Bossam kimchi is pickled Korean cabbage stuffed with fruit, seafood, mushrooms, vegetables and various garnishes. 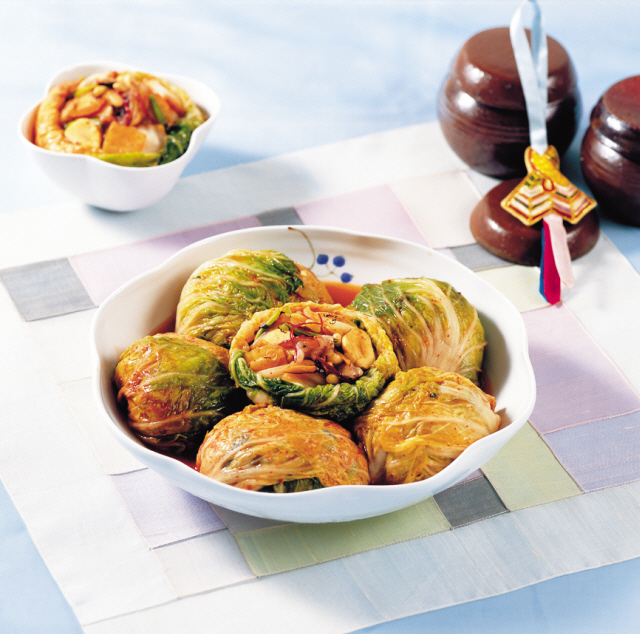 Bossam kimchi is made by wrapping the stuffed cabbage with cabbage leaves, and it is also called “bokimchi.” It became popular in the Gaeseong area of North Korea, where good quality cabbage was grown in the old days. 1. Trim the bottom and outer leaves of the cabbage, put a deep knife slit lengthwise and split it into two parts by hand. Marinate it in salt water in which half of the coarse salt dissolved, and spread the remaining half of the salt in between the petioles. Let it sit cut side up for 3 hours, and then another 3 hours after turn over. 2. Rinse the marinated cabbage under running water 3-4 times, drain facing down for 1 hour. 3. Cut the cabbage, radish and pear into one-inch squares. Save outer leaves. Cut the mustard leaves, small green onion, watercress and green onion into 3 cm-long pieces. 4. Soak the mushrooms in water for 1 hour, remove stems of brown oak mushrooms, wipe dry and shred finely. Remove stems of the stone mushrooms, rub clean and shred into long, fine slivers. 5. Skin the chestnuts and slice finely. Cut the jujube flesh away and shred it in the same way as the brown oak mushrooms. 6. Cut the shredded red pepper into 2 cm long pieces. Remove tops of pine nuts and wipe clean. 7. Mince the salted shrimps finely. 8. Cut the flesh of the salted yellow corvena, save the heads and bones. 9. Rinse the oysters in salt water then drain. Rub the young octopus with salt and cut into 3 cm pieces. 10. Place water and the heads and bones of the salted corvena in the pot, boil for 5 min. on medium heat and strain to make corvena liquid. 11. Mix the shredded cabbage and radish with ground red pepper, add the salted shrimp and corvena flesh and seasoning, and mix thoroughly. Add all the prepared vegetables and mix evenly. Add 2/3 of the seafood to it, mix them softly, then season with salt. 12. Put 3-4 sheets of cabbage outer leaves on the bowl. Heap the mixture on top, place the remaining 1/3 of the seafood and garnish on it. Roll the outer leaves up and wrap them tightly. 13. Put the wrapped kimchi into a container one by one and press down. Add the boiled corvena liquid into the jar. ● Discard just a few tough outer leaves from cabbage, and use as many of the remaining leaves as possible. ● This wrapped kimchi has been called “bokimchi” (restorative kimchi), because it wraps all sorts of flavors with marinated cabbage.